I had the privilege of taking a tour of the new Bohlsen Family Emergency Department at Southside Hospital. Once I walked through the sliding doors only one word came to my mind: WOW. This newly renovated facility had light colored walls, a beautiful structure, an open atmosphere and a welcoming feeling to it. I was greeted by Jim Wescott, ED Nurse Manager, and Harold Fischer, ED Director of Patient Care Services, who began to explain this beautifully built facility. 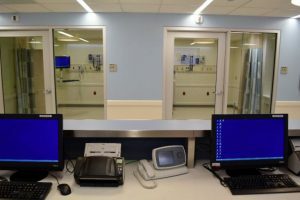 The new building is three times larger than the old ED, and is able to treat 70,000 patients a year because of the new set-up, process improvements, and the amount of staff they have working at any given time. 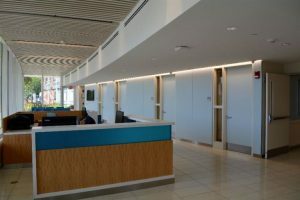 Looking around the new 30,000 square foot facility I began to ask a million questions – what were the new rooms I was looking at? What did the lighting system above each door mean? Why was the department built this way? The list went on, and on. 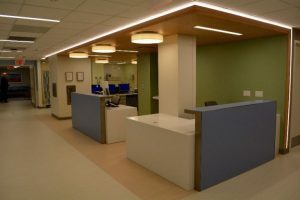 They then went into the building design and how it was created with two major factors in mind, the patient experience and employee needs. Designed for efficiency, the re-construction of the ED absorbs excess noise so it creates a calming atmosphere, even when it’s at full capacity. You can actually hear a pin drop! 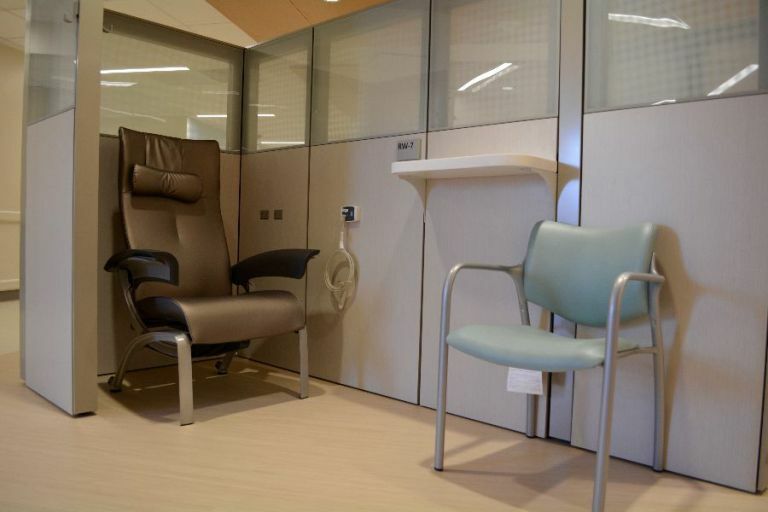 There are two central nursing stations so it gives nurses and doctors the extra room they need and creates a better working environment. 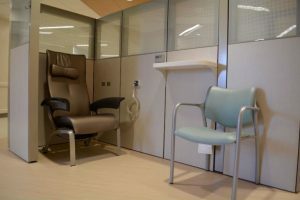 With 16 private rooms and a 5 bed isolation unit, the nurses are constantly moving between patients, and after talking to a few it was clear that they appreciate having two stations to choose from. “I love the new ED – it’s great to have 2 nurses’ stations because you always have access to what you need when you need it. When you have 2 stations, you are constantly in contact with everyone and you are always walking past your patients, which makes you check on them more. This also increases communication between nurses and doctors with their patients which allows us to provide them with the best care possible.” said Jeanette Pisano, Emergency RN. From there we headed towards the new Behavioral Health Department which was designed for the safety of the patients, as well as the staff. The unit consists of 6 private rooms with a secure interview room when they first check in. 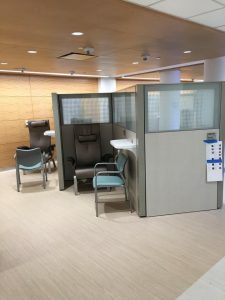 I was able to chat with the staff working there which consisted of security guards, social workers, registered nurses, environmental services workers, and a psychiatrist. The great part about the layout of the department was that the workers always have views of all of the rooms so they could keep watch of their patients while talking to me. 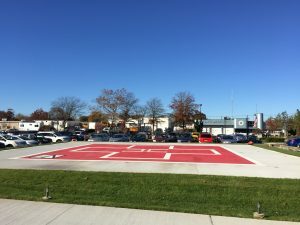 The unique part about the new Behavioral Health department was that they had their own ambulance entrance for patients to come through. This was something that the nurses really loved, because the team can immediately start assessing patients and give them the care they needed without having to go through the ED. 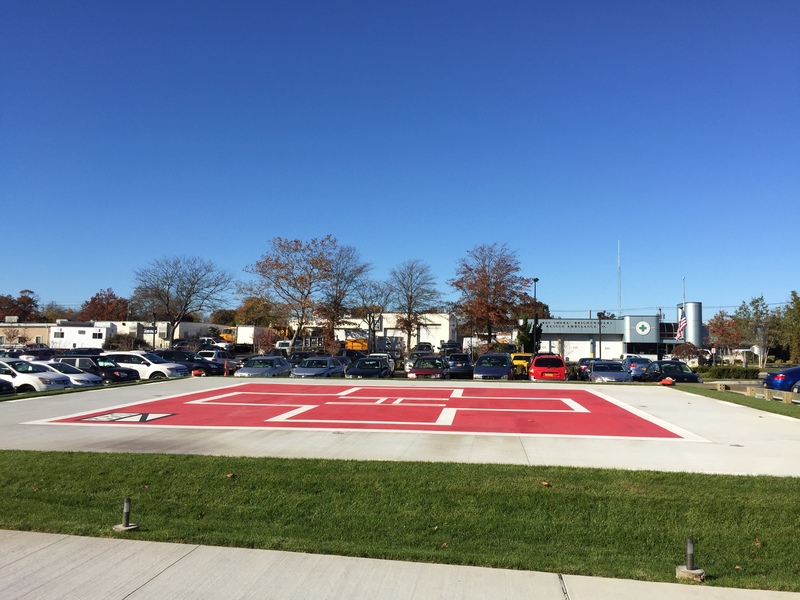 The rest of the trip consisted of viewing the helipad for our SkyHealth helicopter program, touring the old Emergency Department, and talking about the next steps to come – which includes a Pediatric ED, infectious disease unit and a new unit for patients who need to have a longer stay. With 60 treatment spaces, radiology suites, a rapid access area, a new layout, and process improvements, it seems as if this new Emergency Department has it all – for the patients, and for the employees. 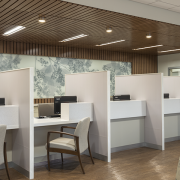 Experience the new Emergency Department for yourself – explore our current openings at Southside Hospital. Q: How long have you been working here? A: I have been a Registered Nurse with Northwell Health since February 13, 1989. I started working at Long Island Jewish Medical Center (LIJ) and transferred to Huntington Hospital June 17, 2013. Q: What positions have you had since being in the health system? A: When I started at LIJ I worked as a Labor and Delivery RN. I stayed in that position for 12 years and in December of 2000 I worked as a Pain Management Nurse within the anesthesia department on labor and delivery for the labor patients. In January 2012, I changed positions to Quality Management at LIJ and I was responsible for core measures and also supported the quality measures within the anesthesia department. In June of 2013 I transferred to Huntington Hospital as a Quality Coordinator and at that time was supporting the OB/GYN/PEDS and Anesthesia departments in their quality program. Q: Has Northwell Health provided you with any career growth opportunities? A: When I transferred from pain management to quality at LIJ, I had the opportunity to attend Beginnings. This was extremely inspiring to me because our President and CEO, Michael Dowling, gave a presentation and asked each of us in the room where we would like to be in 5 years, or even 10, and inspired me to return to school for my Master’s degree in nursing administration. At this time I have only 2 more classes before I complete my Master’s degree and this has allowed me to climb the ladder with my career here at Huntington Hospital. In February, I was chosen to become the Manager of the Nursery/Special Care Nursery and in September I became the Nurse Manager of the maternity unit as well. This has been a wonderful experience to grow my career. I have been involved in many leadership classes at the eastern region level and also at the system level at the Institute for Nursing and at the Center for Learning and Innovation. I was also able to attend graduate school because the health system pays, encourages and is supportive of nursing higher education. I am grateful for the opportunities the health system offers and I would not have been able to attend the program if their support was not available to me. Q: What do you love most about working in nursing at Northwell Health? A: I love all the opportunities available to nurses that allow us to continue to be a lifelong learners. I am proud to work for the largest private employer in New York State, and when people ask where I work I proudly say Northwell Health at Huntington Hospital. So many of things I previously stated are the reasons I LOVE working for the system. I have worked here since I am 22 years old, going through many milestones in my life, and I have always felt that this organization is supportive of their nurses and honored home/work life balance. Not only am I proud to be a nurse in the system, but I have encouraged all new nurses that I meet to apply and work in a Northwell hospital. I am extremely passionate about having people come to one of our hospitals that I even encouraged my daughter, who was actually born at LIJ, to seek employment and she now works in labor and delivery at LIJ. I am truly grateful for the opportunities Northwell has provided for me over all these years, and am excited to see what the years to come have in store for me. Picture: This group photo shows Jill (From left to right, she is the 5th woman in the back row) and some of the nurses in her unit. Explore our unlimited career possibilities at Huntington Hospital. Hear from Kory Stimpfl, Assistant Director of Engineering and Plant Operations, and Roger Arnott, Director of Engineering and Maintenance, about why they chose Northwell Health as the place to grow their engineering career. Why did you choose to pursue an engineering career at Northwell Health. KS: Huntington Hospital, and through them Northwell Health, has been a staple of the community for my entire life. I was born at Huntington Hospital, so I am grateful for the chance to work here and help make it even better. I have had many family and friends that have been helped right here, and now I have the chance to use my engineering skills to help other peoples family and friends. RA: I personally chose to come to Northwell Health because I wanted to work in a field where I could use my skills and abilities to help people. Tell me a little bit about your background? Were you always in health care – if you weren’t, why did you decide to get into the field? KS: I graduated college from SUNY Maritime College in the spring of 2015 with a Bachelor’s degree in electrical engineering and a Coast Guard Marine Engineering License. Using this license I got a job as a civilian contractor with the US Navy. In this job I was on a team that took care of the engine room of one of the navy’s civilian ships. I worked for them for almost a year, during which time I was traveling all over the country and the world. I realized that I wanted something that was more stationary but also wanted to see how my engineering was benefiting people, because in my old job there was a much greater divide between myself and the “customer”. When I started looking for jobs, Huntington Hospital immediately stuck out because it would allow me the best of both worlds. As the Assistant director of Engineering I can use my engineering talents to help the hospital not only with the day to day facility operations, but also with the improvements to it going forward. Every day I know that the work that I am doing in the health care field will help save people’s lives, or at least help the medical staff save people’s lives. RA: My career started in the Marine Industry after graduating from The U.S. Merchant Marine Academy. After working as a Marine Engineer for almost 30 years, including operations in Desert Storm, Iraqi Freedom and Enduring Freedom and much international travel, it was time for a change. My new path took me to Brooklyn, New York for the next five years and a large 46 high story building housing complex with a centralized power plant. 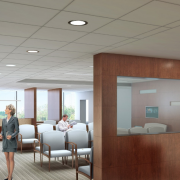 An engineering opportunity then arose to come to Northwell Health Huntington Hospital. I had grown up in Huntington, NY and the opportunity to work and help people at the very hospital I was born in was extremely appealing to me. This was my first endeavor into the Healthcare Industry. What career growth opportunities does Northwell provide for you and all engineering professionals? KS: Northwell health is a large healthcare system, and is always growing. As with any system this large, it begins to take on a lot of its own engineering and facility work. As an engineer within the system, there are opportunities to grow within the individual hospitals and into the Physical Assets department and beyond. As a young engineer, there is incredible room for growth within the system. RA: I believe Northwell Health offers growth opportunities for engineering professionals in different ways. The many engineering responsibilities at a hospital afford engineers the opportunity to hone their skills and expertise in many different disciplines. 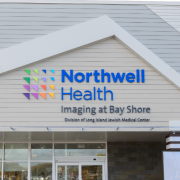 In addition, Northwell Health is a large and ever growing organization. This allows one many opportunities for future career advancements. Why would you encourage other engineers to work for our health system? KS: Working in this health system allows you to have a direct impact on helping people. The sense of purpose here is incredible, all it takes is a walk around the hospital to see all the amazing things that are possible because of the work that our department does every day. RA: If you are a person who desires work that is personally rewarding and professionally challenging, then Healthcare industry is a good field for you. Northwell Health is a great system because it believes in and fosters a culture where everyone is a caregiver to its patients. You truly feel you are part of a coordinated team supplying patient care. What new initiatives/ projects have you worked on? KS: Since July I have been involved multiple projects including the commissioning of two new emergency diesels and testing of their associated transfer switches. I have participated directly in the patient’s environment through Environment of Care rounds and through mock Joint Commission inspections. I have also been involved in the planning of the installation of three new boilers and two new air cooled HVAC chillers. As these projects complete there are always new ideas and projects around the corner that need some input from our department. This ensures that the job will always be exciting. RA: Since my start a few months back I have been involved in numerous projects of varying sizes. Although it was started before my tenure I have been working to finalize and commission our new Emergency Department addition and its associated 3 MW of emergency diesel power system. I have also been working on the design and construction for three Main boiler installations totaling 650hp, and a chiller relocation and replacement project for 800 tons of air cooled chillers. Both of these projects being simply the first phase of a two phase projects. Additionally, we are also doing work for a new Hyperbaric unit requiring the installation of an additional Oxygen tank and pad, re-powering from 208 VAC to 480VAC, installation of new lab testing equipment, installation of new nuclear medicine equipment , replacement of an Underground fuel oil tank and new air handling equipment. This is all happening coincidentally with multiple departmental re-locations and renovations as well as the day to day repairs and maintenance of the hospital. It is a busy pace covering many Engineering disciplines but is extremely rewarding. Interested in joining our team of engineers? Explore our unlimited career possibilities today.